A friend recently lost her adult daughter. These are among the toughest cards to make – especially when you find the words difficult to express and the colors challenging. I wanted something that was relatively clean but also had some color and pattern. 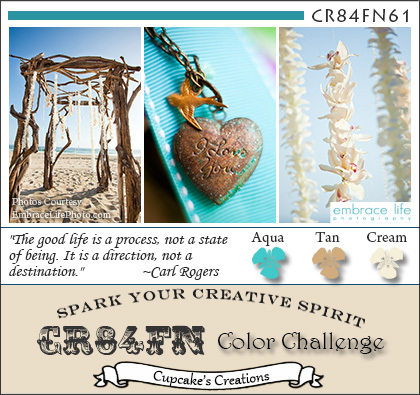 To start the design process, I found a color palette at Cr8FN Color Challenge. I have always loved aqua and tan. The cream was a lovely gentle addition to the palette. I used my Papertrey Ink (PTI) Friendship Jar Filler for the daisy bunch and stamped it in Classic Kraft ink. The exterior and interior sentiments from the PTI Willow stamp set was stamped in Aqua Mist. The base cardstock is PTI Vintage Cream. The kraft cardstock has a gold tone and the patterned paper is from Kaisercraft Chapter One. I cut the patterned paper daisy with the “Flower Shoppe” cartridge at 1.5 inches tall. I trimmed back the top two petals and curled all the petals using the stamped image as a guide. The petals were edged with Memento Rich Cocoa and there is the added dimension with 3 layers of pop dots. The center was hand cut. I added some shading with my Copic BG000 along the outer edge of the flowers and the leaves. The rustic twine bow is also from PTI; I punched two small holes on each side of the bunch and threaded the twine through before assembling the layers. Even when cards are challenging to make, I think it is worth the effort. Peace be with you. Beautiful card, and I’m sure it will give the recipient comfort. Your card is lovely. The colors are perfect and I love the clean lines. Thank you for the tip on finding inspiration– these are the hardest kinds of cards to make for sure. It’s a truly beautiful card. And, if anything can bring her comfort during this time, I’m sure that your card and knowing that you care, will. This is such a peaceful card. I love that inspiration board too. 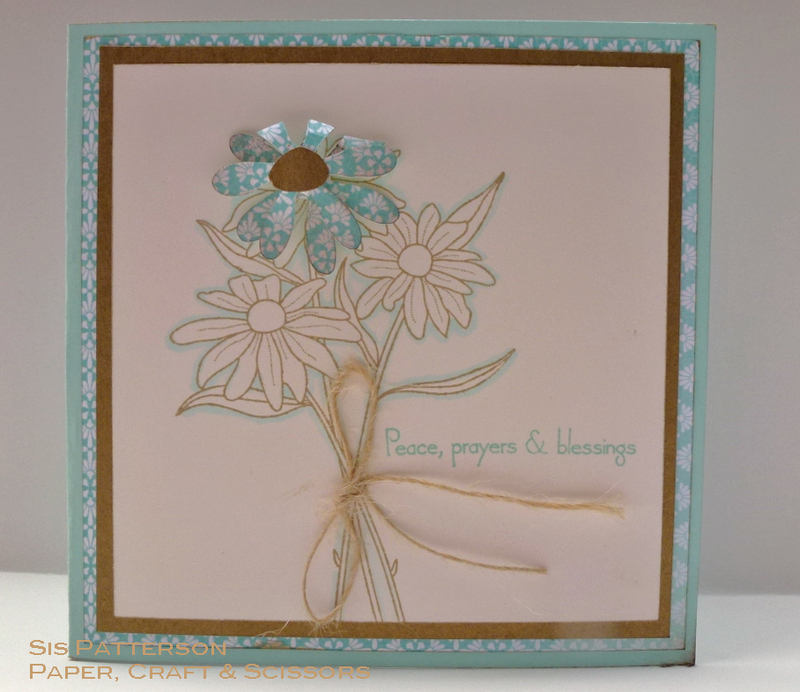 A beautiful card, I like the one highlighted paper pieced flower, and the CAS design. This is a very soothing card. The colors and design create a soft warming effect. I like the words; they send a very powerful message of comfort. It is a beautiful card and I am sure your friend will appreciate it during this tough time in her life. I agree that these are always so hard to make, but I think this is beautiful. I’m sure that it will be much appreciated by your friend. Thanks for playing along with CR84FN this week! How kind of you to work so hard to create a card for your friend, expressing your love and caring to your friend. Thank you for being so very kind.